A lively and vibrant persona exemplified – that is what Leela Bordia is all about. One can see the magnitude, grace and fortitude instilled in this powerhouse of a lady who has strived all her life for the upliftment and betterment of her fellow countrymen and has been accredited with reinstating the glory and stature of Blue Pottery - this once upon a time nearly extinct and dying craft form. 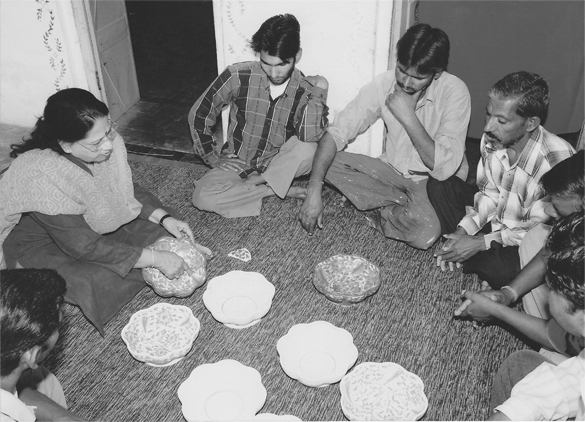 The resurrection journey of Blue Pottery commenced during the year 1978, when Leela Bordia was engaged in social welfare activities in the villages in and around Jaipur district of Rajasthan, India. During her forays she chanced upon noticing some artisans selling their wares of traditional Blue Pottery items. She was instantly attracted to the vibrancy, grace, feel and demure kind of styling of the traditional Blue Pottery merchandise on display. She however saw that despite having the skills of this fine craft, the craftsmen appeared to be in a paltry state of affairs. She realized that the craftsmen had no means of marketing their products and had to sustain on the meagre sum of money that they made when a sale was made by them, which was by no means a regular feature for them. At that time, the traditional Blue Pottery items consisted of big vases, pots and other heavy items. This naturally needed a big and rich customer owing to the size and material cost of the products. Leela Bordia pondered on the possibilities of innovating away from the well trodden path of Blue Pottery items and envisioned small, delicate and day-to-day useful items made with the same materials. The result of her ingenious vision and dedication to the craft brought forth beauty and intricacy in the form of enchanting door knobs, beads, curtain rods, ashtrays, candle stands, lanterns, coasters, decanters, perfume bottles and other astonishing but useful items. With the basic objective of doing good for the Blue Pottery craftsmen, Leela Bordia started Neerja International to help the craftsmen in marketing and promoting the Blue Pottery items. Her endeavors had both tales of ups and downs but steadfastly Leela Bordia strode onwards and turned the tide in her favour. 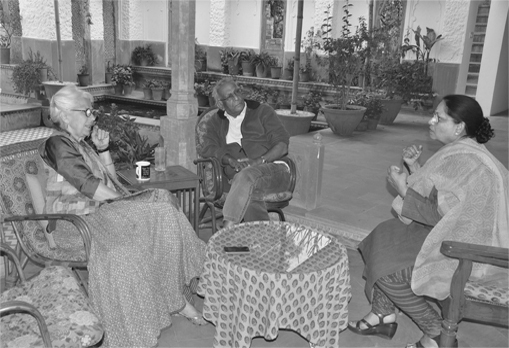 Leela Bordia has traversed these last 3 decades to instill smiles and self reliance abilities in the small villages in and around Jaipur District. Her policy of ‘We shall succeed jointly’, rather than ‘I’ shall succeed solely has always held her in high esteem in the hearts of her co-artisans, well-wishers as well as the Indian and Foreign Print Media who have spoken volumes on her. Today, Leela Bordia and her firm Neerja International are synonymous with the name of Blue Pottery objects. She has not only reinstated this intricate craft back to its lost glory of the yesteryears, but has also been the originator of innumerable new and innovative Blue Pottery articles. Her work has been flawlessly accepted by one and all and the Awards and Felicitations ornamenting her Office over the years are proof enough of her excellence and recognition. Leela Bordia’s selfless endeavors are reminiscent of the bygone days of her beloved mother’s sojourns with Mother Teresa to the slum areas and dwellings to tend to the requirements of the needy. Those visits had a lasting effect on the vivacious child Leela, and thus, grew in her the love for Social Work for her fellow citizens. 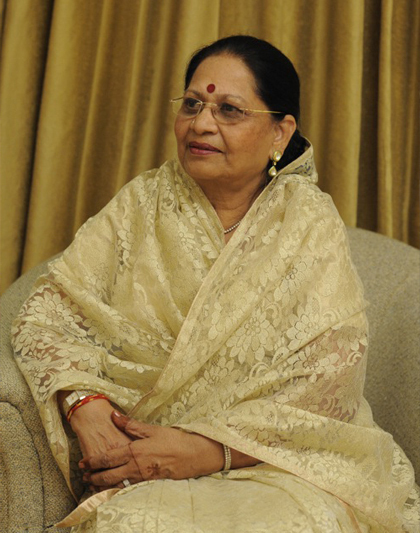 When Leela (as a new bride) stepped onto the threshold of her Engineer husband Mr. Kamal Bordia’s house (with mixed feelings that are so common with a new bride), little did she know that her doting husband and charming mother-in-law would be her staunchest of supporters for her Social Service work to the neighboring villages of Jaipur. Today the hundreds of craft persons detailed in Blue Pottery manufacture are thankfully indebted to Leela Bordia and her iconic family for their kindness and selflessness which inevitably led to the craftsmen’s prosperity and well-being. The benevolent couple Kamal & Leela Bordia is blessed with a delightful daughter Aparna (who is an integral part of Neerja International) & an illustrious son Apurv (who is engaged in an enterprising business named Neerja Softwares Pvt Ltd for creating and designing Websites and E-Commerce Gateways). Their Daughter-in-law (affectionately called Dil (heart) of the family) Nupur Bordia is entirely devoted to the nitty-gritty of Neerja International. She follows closely in the footsteps of her multi-faceted mother-in-law and mentor Ms. Leela Bordia and seeks her advice and guidance on all issues related to Neerja International. The unquestioning die-hard support of the entire Bordia family has stimulated the growth of where Neerja International finds itself today. It is a heartwarming thing to note that even in this day and age when youngsters breeze away to foreign lands in their quests for money, glory and unfettered freedom, the family members of Ms. Leela Bordia prefer to remain in their close knit family culture and business concern i.e. Neerja International. Certificate of Merit for Excellent Export Growth for Ceramic Artwares 2011-2012 by E.P.C.H. Life Time Achievement Award for Service to the Handicrafts Sector by E.P.C.H. Honored By Bank of Baroda, Jaipur for Excellence In Exports. Certificate of Recognition: Given by Globus, Switzerland. 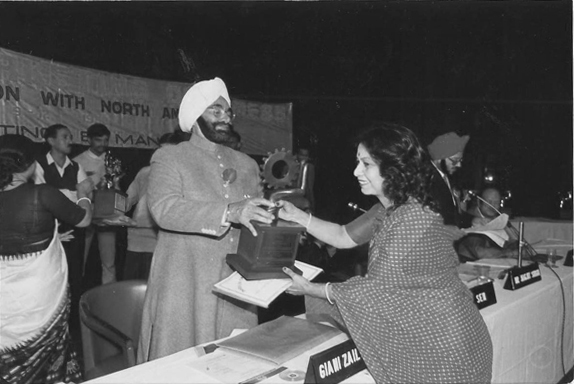 National Award for Best Woman Entrepreneur, given by Institute of Marketing and Management.